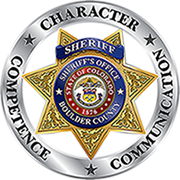 The Boulder County Hazardous Device Response Team, more commonly referred to as “the Bomb Squad”, is used to resolve situations that involve actual or suspected explosives and explosive compounds. Some of the events handled by the Bomb Squad are suspicious packages, Improvised Explosive Devices (I.E.D.’s) and the safe disposal of illegal or confiscated fireworks and ammunition. The Bomb Squad also provides support to the Sheriff’s Office’ and Longmont Police Department’s SWAT teams for breeching (explosive entries) and the use of a Remotec F6A robot for surveillance and unmanned entries. The team is a nationally accredited multi-agency unit, comprised of six certified Hazardous Devices Technicians from the Boulder County Sheriff’s Office, Longmont Police Department, and Longmont Fire Department. In 2009, the Bomb Squad responded to 50 calls for service, which included actual improvised explosive devices (IED) or explosive compounds, assists to the Special Weapons And Tactics (S.W.A.T.) teams, and public presentations at local businesses and schools. In 2009, the Bomb Squad received approval for the purchase in 2010 of a specially designed Ammunition/Fireworks burner. This will allow the team to complete the destruction of confiscated fireworks and ammunition in a safer, more efficient manner.